Many opponents of the family bed and co-sleeping claim it is unsafe. It is true that injuries and tragic deaths have occurred when babies are placed in adult beds, but most of the time this is the fault of parents who do not remove bedding or practice safe co-sleeping practices. Drop-side cribs make it easier to get babies in and out, but can also trap children, especially when the cribs have broken pieces or missing hardware. In addition to at least 32 deaths in drop-side cribs, there were 14 deaths because of entrapment that could have been caused by a drop-side, according to the Consumer Product Safety Commission, which issued the new crib standards. More than 9 million drop-side cribs have been recalled since 2007, CPSC says. It’s not just drop-side cribs that are to blame. In fact, a new study has found that on average, 26 babies are injured a day in the US from cribs. Yeh and colleagues conducted a retrospective analysis of data from the National Electronic Injury Surveillance System of children younger than 2 years who had been treated in emergency departments in the United States for injuries associated with cribs, playpens, and bassinets. Data from 1990 through 2008 were included in the analysis. During this 19-year study period, an estimated 181,654 (95% confidence interval [CI], 148,548 – 214,761) children younger than 2 years were treated. On average, there were 9561 cases per year, which is estimated to represent 12.1 injuries per 10,000 children younger than 2 years per year. Of the injuries, 83.2% were attributed to cribs, 12.6% to playpens, and 4.2% to bassinets. In 66.2% of cases, falls were cited as the main cause of injury. The most common diagnosis was soft-tissue injuries (34.1%), and the most common area of injury was to the head or neck (40.3%). What we need to do is calculate the relative riskiness of an infant sleeping in an adult bed versus a crib. We can do that by dividing a measure of danger for each situation by the prevalence, or frequency, of that situation, and then comparing them. (Oddly, the CPSC never presents relative risks.) Using government figures, we can perform a rough calculation to show that infants are more than twice as safe in adult beds as in cribs. 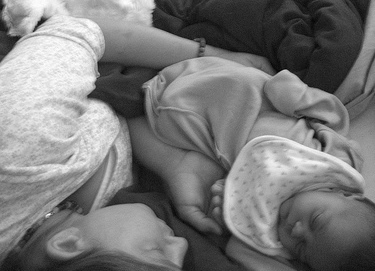 This is aside from the many other advantages of cosleeping or bedsharing, such as increased breastfeeding and physiological regulation, the experience of having slept well, parents’ feeling of assurance that their child is well and happy, the enhanced security of psychological attachment and family togetherness, and family enjoyment. Parents rely on the CPSC to make sure cribs, playpens, and bassinets are safe for baby. Given the statistics on daily injuries, they are failing miserably at their job. In my opinion (and psychological benefits aside), parents are much better off following safe co-sleeping guidelines than trusting the CSPC to ensure cribs are safe. Considering falls are largely to blame for the injuries found in the study, those rails and sides really don’t offer your babies much protection. Nothing can replace adult supervision. Great points. I could never get my husband to agree to fully cosleep with our babies, but I always managed some. Very glad to have a little more information on the relative safety of each type. I usually don’t use all caps but…NICE WORK! My wife, four year old son and I co-sleep. Have you read the Time magazine article on attachment parenting? I’m currently in the process or writing a letter questioning there “Science” in the sideline that stated SIDS increased in co-sleeping. I have been avoiding it! I suppose I should read it.